Kuzana was born in Bombay, attended school in Surrey, Kodaikanal, and New York. She graduated from SUNY Purchase with a BFA in 1995. At an early age, Kuzana was introduced to cultures, different from her own, and soon cultivated a love for travel. She has lived in several foreign countries, such as South Korea most recently. Kuzana and her husband were in Kyung Ju for six years. She recently attended a residency and exhibited her work in Sri Lanka. Currently, Kuzana lives in New Mexico with her husband. 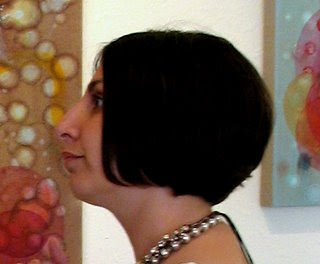 Kuzana’s work revolves around images both botanical and biological in origin. These forms and colors take on new meaning when juxtaposed as a metaphor for the human experience. I combine botanical and anthropological forms to describe my relationship to the environment. These abstracted and distilled forms, combined with layers of varying transparency, convey my experiences and memories of life in foreign countries. I was born in Bombay, attended school in Surrey, Kodaikanal, and New York. In 1995, I graduated from SUNY Purchase with a BFA. From a young age, I have been surrounded by beauty. The gardens in Bombay were lush, varied, and bursting with insects and birds of all kinds. At the matrix of this paradise were two elegant grandmothers swathed in silk saris. From them I learned of the wealth of Indian textiles, the tradition of miniature painting, and an appreciation for Bharat Natayaam. My oil paintings are decorative and abstract. In my work, I am interested in creating color through layers. One of my favorite forms is a simplified mango shape. It embodies the union of botanical and biological forms because it also looks like a developing embryo. In addition to the honor of exhibiting my work with my contemporaries, I have enjoyed participating in several art residencies. So far so good! More painting!